Renewable Natural Gas (RNG) quality specifications refer to the characteristics that biogas must have, once it is upgraded, in order to be injected into a gas network. Developers must therefore take them into account to carry out their RNG injection project. What are the main RNG quality standards in North America? Biogas upgrading increases the part of methane to at least 90%. To achieve this, the process removes all other components of raw biogas, such as CO2, water and oxygen. The goal is to achieve the quality of natural gas. The figure above only presents only two upgrading processes. To know more, read our article about biogas upgrading technologies. The market for RNG injection is gaining momentum among project developers. They can earn a stable income by selling RNG or raw biogas to an RNG supplier. Doing so, they also benefit from proven expertise and established customers. This market has a great potential and many stakeholders are aiming at its development. In Canada, Canadian Gas Association set a target of replacing 10% of natural gas with RNG by 2030. In the US, Renewable Fuel Standard (RFS) requires minimum volume of renewable fuel in transportation fuel (36 bln gallons of renewable fuel by 2022). However, existing barriers slow down the development of the RNG/biomethane injection market. In Canada as in the United States, the federal government does not set RNG quality specifications. Rather, the quality requirements vary depending on the company and are sometimes set on a case-by-case basis. These obstacles increase project costs because the developer has to comply with strict regulations. Without set biomethane quality standards, the developer must know different quality requirements depending on the utility. In the United States, various industry players recognize the lack of homogeneity in quality specifications for RNG injection. Stakeholders such as ABC and Northeast Association are working to standardize them. Also, several gas utilities in the USA have RNG programs and their own requirements for the quality of RNG injected into their grid. 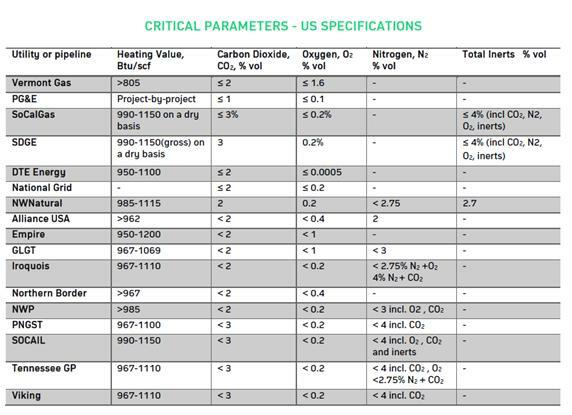 Critical parameters of RNG/biomethane quality specifications in US are summarized in the table below. The table contains the specifications of utilities that have standards for RNG/biomethane, as well as general specifications of TransCanada and other US pipelines for reference. Moreover, several of the industry players that are working on the standardization of RNG injection quality specifications and the main american gas utilities are presented below. The American Biogas Council, because of the variety of existing RNG quality specifications in the United States, published its recommendations. The association relied on data from a dozen companies injecting RNG into the natural gas grid and current parameters. In New York State, Northeast Gas Association is working on an “RNG Interconnect Guidance Document”. This association intend to enhance understanding of both technical and policy issues to ensure RNG projects interconnect success. Vermont Gas has VGS Renewable Natural Gas Program. Currently, they are supplying their network with RNG from Quebec landfills, with several other projects under development. Vermont Gas customers may choose to receive 10%, 25%, 50% or 100% RNG over natural gas. The San Diego Gas & Electric Company does not have a formal RNG program. However, the utility has biomethane injection standards and works in collaboration with other utilities for RNG projects. Find out more information about the company on the Website of San Diego Gas & Electric Company. DTE Energy is a Michigan-based company that has the BiogreenGas Program. It aims to capture biogas from landfills and convert it to RNG/biomethane. Customers can choose to join the program or not. NW Natural is a gas supplier located in Oregon that manages the NW Natural RNG Program. Although, to date, no biogas plant in Oregon produces RNG, there have several upcoming projects. There are other utilities working on RNG programs. For more information, contact us. In Canada, only Quebec imposes biomethane quality requirements for its injection into the natural gas system at the provincial level with its standard BNQ 3672-100 / 2012. 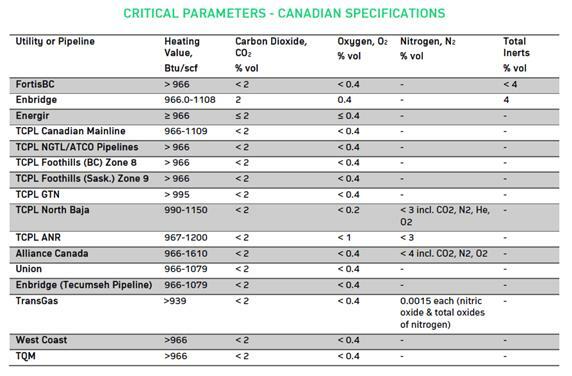 The following table summarizes the RNG quality standards for gas injection into pipelines, according to the major Canadian gas suppliers. General gas standards for TCPL and other utilities are as well presented for reference. The profiles of the companies active in RNG market can be found below. Fortis BC has been offering RNG Program in British Columbia since 2011. It is the very first program for renewable natural gas in Canada. Two options are available to the project developer or biogas producer working with Fortis BC for the sale of raw biogas or RNG/biomethane. Fortis BC can offer the project developer or producer up to $ 30 / GJ for RNG that meets pipeline quality standards. The purchase price of raw biogas is lower. Check their Supplier Guide or their website for more information. Read more about Enbridge on their Website. Énergir is the main gas supplier in Quebec. The company has an RNG program focused on the supply of renewable natural gas since 2017. It is based on the RNG quality specifications imposed by the Quebec government, BNQ 3672-100 / 2012. The company plans to distribute 280 mln of renewable natural gas by 2025. For now, their reference project, the Saint-Hyacinthe plant, is injecting 13 mln m3 of renewable natural gas into the gas grid per year since 2018. See the Énergir gas network map or their page on our website. Need more information on RNG market? BiogasWorld has recently issued RNG/Biomethane Market Intelligence Report available for free to our Premium members. The report contains market overview for North America and selected European countries as well as information on RNG quality standards and utilities active in the industry. It also gives you an overview of competition in RNG/Biomethane upgrading market. To receive a report overview, contact us. 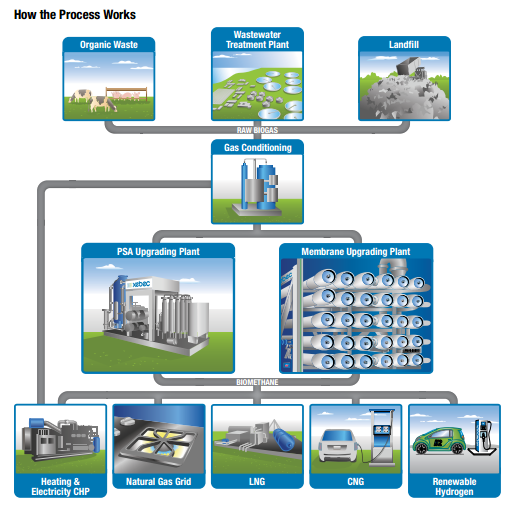 As with any biogas plant, you must evaluate the feasibility of your RNG injection project. We want to make this crucial stage easier for you. That’s why we’ve put together an Advanced Biogas Report for you to get strategic data in one click. Prepare a solid basis to ensure the success of your project! « Come and meet Biogasworld team and members at Americana 2019!